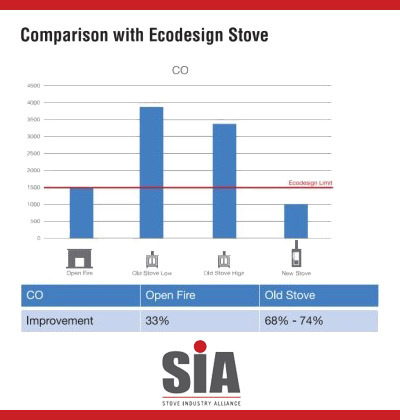 On Monday 28th February 2017, the Stove Industry Alliance (SIA) launched the new Ecodesign initiative in Parliament. Ecodesign is the European-wide directive to lower emissions which will come into full force in the UK in 2022. The recent air quality concerns in London has brought home the importance of improving air quality. Along with diesel cars, burning wood is a source of ‘particulate matter’. Dr Fuller of Kings College, London has estimated that in winter time, wood burning accounts for around 10% of London particulate matter emissions. Even though wood burning is having a significant impact on carbon reduction, the concentration of particulate matter emissions is dependent on how the wood is burnt. For example, burning wood on an open fire can produce 90% more particulate matter than burning wood in a new Ecodesign Ready stove. 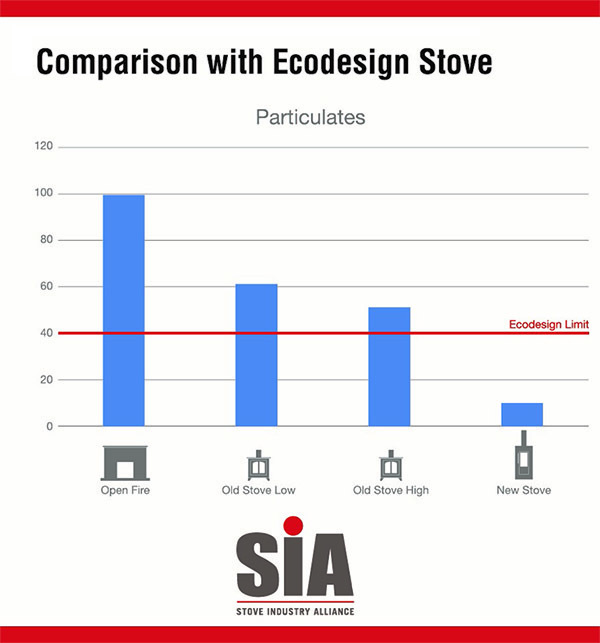 Older stoves that don’t meet these new limits can produce 80% more particulate matter. The Stove Industry Alliance (SIA) working with government departments and the major stove manufacturers are helping to develop stoves that will efficiently heat our homes, whilst significantly reducing the production of CO2 and other emissions and meeting the new stringent emission limits. From 2020, the participating manufacturers will only be supplying these new Ecodesign Ready compliant stoves, two years ahead of schedule. 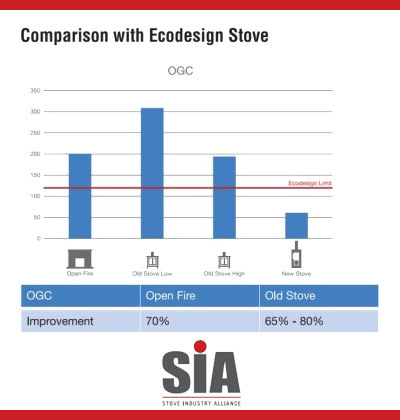 The Ecodesign Ready stoves will also lead to reductions in CO, NOx and Organic Gaseous Compounds (OGC). 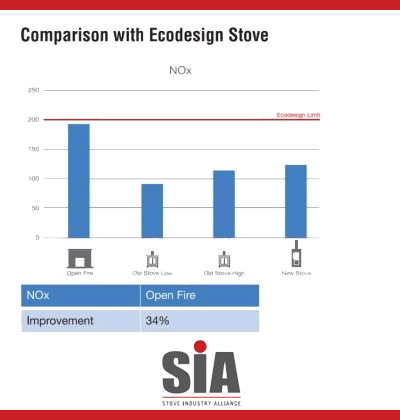 The following charts show the comparison figures for production of particulate matter, OGC, CO ad NOx when using open fires, older stoves compared to Ecodesign Ready stoves. The 2015 DECC Domestic Wood Usage Survey revealed that 70% of the wood burnt in London is on open fires. 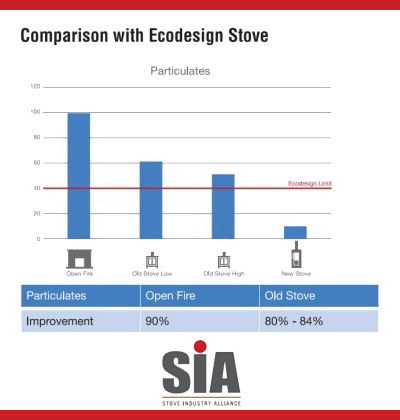 Independent research conducted by Kiwa (Kiwa Ltd carries out independent testing on appliances and other products) has shown that Ecodesign Ready stoves can reduce particulate emissions by 90% compared to an open fire and 80% compared to a stove of 10 years ago. The replacement of open fires with Ecodesign Ready stoves could significantly reduce the level of emissions of wood burning.